America’s postmasters have always been rather well known over the years for their inventiveness. Before the United States Post Office Department could follow the lead of Great Britain and issue its first postage stamps, postmasters like New York City’s Robert Morris had gone ahead and developed their own postmaster’s provisional stamps. It seemed that, when the local postmaster saw a need, he somehow found time and creative juices to fill it. W.N. Collins, the postmaster of Kansas City, Mo., was just such an inventor. During the latter months of 1914, the main post office employees found themselves with 93,600 one-cent and 69,200 two-cent imperforated stamps. The sheets of stamps (Scott Nos. 408 and 409) had become unsalable. They had originally been issued imperforate by the U.S. Post Office Department to supply the demand for private vending machine companies. Rather than seek authorization to destroy the unsalable stamps, Postmaster Collins came up with a rather simple, but quite effective idea. Having seen women use tracing roulette wheels in their pastime of dressmaking, he knew that such inexpensive devices could cut small slits into paper in order to more easily tear it apart. So he sent a couple of clerks down to a local dry goods store and, according to local stories, they purchase 15 tracing wheels. It’s interesting to note that each of the tracing wheels were slightly different in construction and, thus, produced slits (rouletted cuts) each of which were different from those of the other 14 wheels. 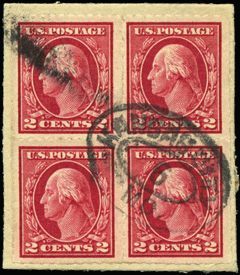 The clerks returned with the tracing wheels and Collins authorized them to score the one and two-cent stamps to create primitive, but still effective, “perforations” between the stamps. Sale of the stamps began shortly thereafter. Obviously, it didn’t take long for local philatelists to discover what was being done. Kansas City had a very active philatelic community centered around the Midwest Philatelic Society, one of the earliest chapters of the American Philatelic Society, and a club that, even today, is still going strong. from one that had been faked. So he had a tiny rubber stamp made reading, “W.C.M.,” and he placed an impression on every rouletted stamp he could get his hands on. If it was a block of four, he applied the rubber stamp to each stamp. 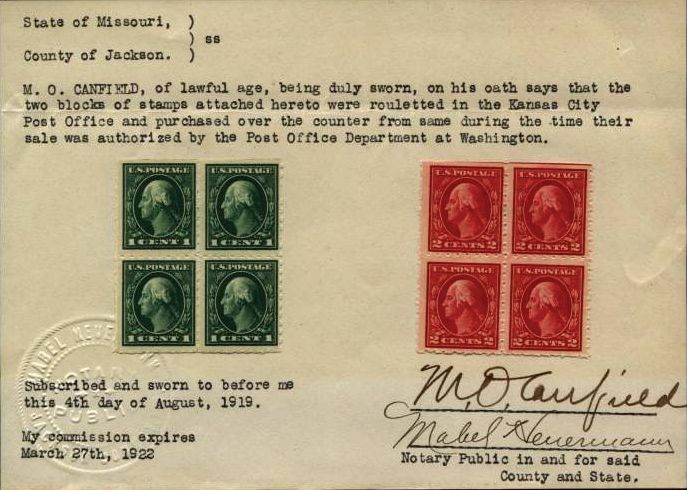 Today, no wise specialist of America’s early 20th century postage stamps would purchase a Kansas City Roulette” without Michaels’ backstamp. Fakes obviously exist, but since the price of mint Kansas City Roulettes is still rather low, such impostors are not out there in huge quantities. The Scott U.S. 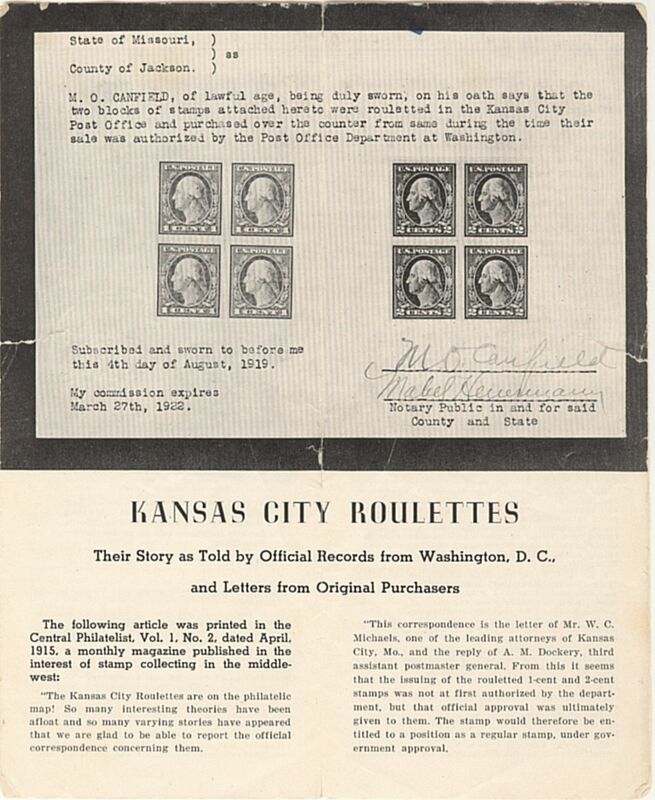 Specialized Catalogue does not list the Kansas City Roulettes in their normal pricing structure, but it does offer a detailed explanation of them and remarks that blocks of four of the one-cent retail at $100, while blocks of the two-cent should be priced at $200. But there is great rarity in these issues when it comes to on cover uses. 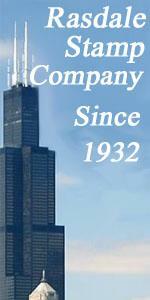 They do exist, but Michaels’ backstamp. Fakes obviously exist, but since the price of mint Kansas City Roulettes is still rather low, such impostors are not out there in huge quantities. on stamp separation, has never been able to purchase one for his well known collection. Scott notes that the earliest known use of the one-cent (No. 408) is October 22, 1914, and the twocent (No. 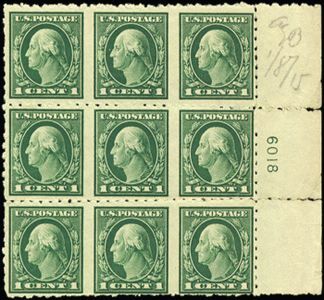 409), November 25, 1914.
rouletted one-cent green and postmarked on December 7, 1914. The card had been authenticated by the Philatelic Foundation in New York. Laurence notes that a similar use had recently been found, but it is not described. He also remarks that the post card shown in his column had been sold by the William Fox auction firm for $325. One of the reasons why such uses are scarce is that the roulettes were officially taken off sale on January 14, 1915. So the period of use for these unusual stamps was quite short-lived, indeed. here) on August 4, 1919, went to special lengths to give the copies he possessed the appearance of being the real McCoy. But Michaels and a good friend, Wilson D. Wood, went even further. They produced a special brochure telling the story of the Kansas City Roulettes and caused it to be distributed widely across the country. Their purpose: Michaels and Wood had a large quantity of the roulettes they wished to sell. One of the most notable things about this unique little publication is the inclusion of a letter from A.M. Dockery, then Third Assistant Postmaster General, who says that he had received a specific description from W.N. Collins concerning exactly how and why the roulettes had been produced. Michaels, Wood and other Kansas City collectors did what they could to make sure the Kansas City Roulettes would be a part of America’s philatelic folklore.